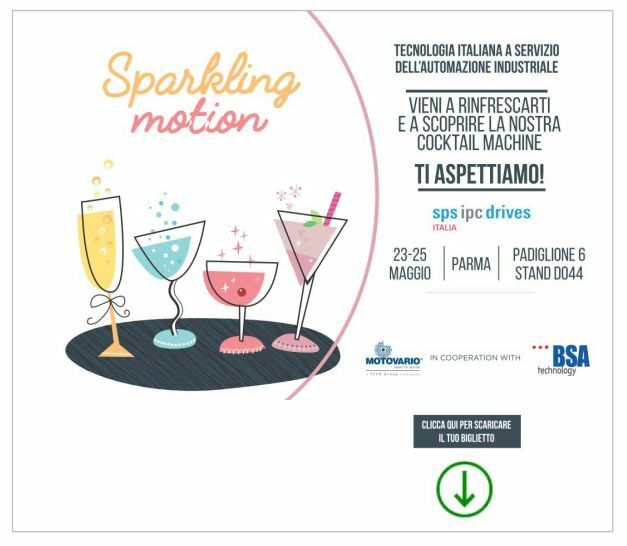 From 23 to 25 May, Motovario and Technology BSA will exhibit together at the SPS IPC Drives in Parma: Hall 6, stand D044. On the stand, the spotlights will be focused on an application machine designed and powered by Motovario, which will serve visitors an original aperitif. On the machine, you will see some of the solutions developed by Motovario for mechatronics. On display is also the new 143 size of the shaft-mounted gear reducer S series coupled to a DRIVON motoinverter, and a B153 helical bevel gear reducer, highly performing solutions in heavy applications. We look forward to seeing you at SPS IPC DRIVES !